The City of Doral (the "City") is hereby submitting the approved 2016 Comprehensive Plan Update, referenced above, in accordance with the State Coordinated Review/ Process. Enclosed is a summary of the proposed amendments to the Goals, Objectives and Policies (GOPs) by individual elements to facilitate the review of this document. This report was prepared by the Planning and Zoning Department for the purpose of providing residents and interested stakeholders with an overview of the development of land in Sections 8 and 17 of the City of Doral. please contact us at michael.ferrera@cityofdoral.com. This Section oversees all new development, and consequently, the growth. The majority of its time is spent guiding developers through the site development approval process. From initial application submittal, to review the of site plans, presentation before the City Council, issuance of a development order and concluding with final inspection. In addition, Staff's works with individuals who seek to rezone a piece of property, vary from the City's setback or other dimensional requirements, operate a unique business as a special exception, install a free-standing or wall sign, modify the exterior of a commercial or industrial building, or to hold a sidewalk sale or an outdoor sales event. 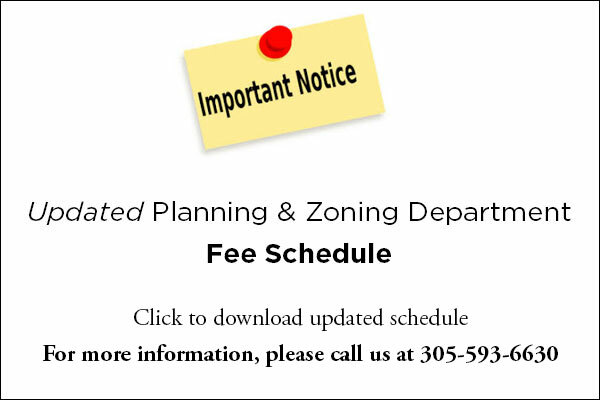 Click here for a general outline of the City of Doral’s development review process for re-zonings, site plans, plats, land use amendments, special exceptions, variances, conditional use, and street vacations. This Section formulates strategic plans to guide the City's development and long-term growth. These plans address such questions as: "Where will the City be 5 years from now or 10 years from now? What kind of stresses will future development place upon the City's existing infrastructure? What kind of changes should we be making over the years to ensure that we can support additional growth?" Asking powerful questions such as these has not only enabled City of Doral to stay on top of its fast-paced growth, but it has given the Planning and Zoning Department the means to realize the City's future vision. This Section formulates and reviews plans for aesthetic improvements to public and private property throughout the City. The majority of Staff's time is spent in the site development plan approval process reviewing landscaping plans for proposed developments, and ensuring that all landscaping work is undertaken as planned. Staff, in conjunction with the Public Works Department and the Parks and Recreation Department, spends the remainder of its time planning for new City parks, proposing new landscaping for medians, and designing City banners and entrance way signs and similar products. The Zoning staff examines plans and in part approves applications for issuance of permits and ensures that projects are carried out in accordance with approved plans. In addition, assist the public on a daily basis by providing general zoning and/ or land use information, such as zoning designation, setback, landscape requirements, signs and property information. Walk-thru hours are from 8:00 am to 11:00 am. 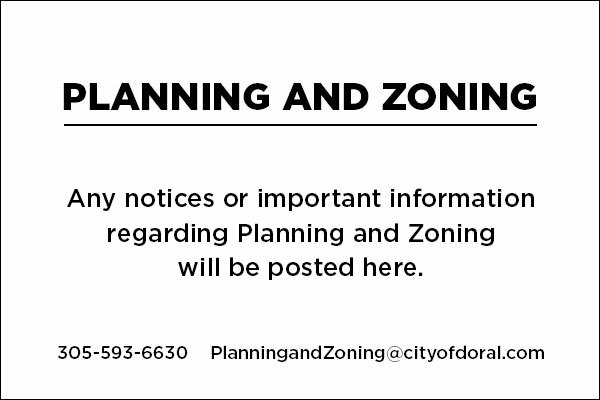 please feel free to contact us at PlanningandZoning@cityofdoral.com. If you wish to obtain a zoning verification letter, please submit a letter with your request with your request, indicating the property address, folio number and briefly describe the information you are requesting. Letters are $50.00 per residential folio number and $100.00 per commercial folio number. Several individuals work in this Section, and quite probably, theirs are the first faces you see when you enter the Department. Operating as customer service representatives, they respond to both over-the-counter and telephone inquiries related to business licensing and providing timely and courteous responses. Furthermore, the main function of this section is to oversee and assist the public regarding the licensing of new businesses and home occupations. Accordingly, this Section keeps abreast of new local, state, and federal laws, requirements, and programs, which are constantly affecting the licensing procedures of the City of Doral. As directed by the City Council and the Comprehensive Development Master plan, the Planning and Zoning Department is tasked, or provides input to other departments with the preparation of various planning studies. As a result of these studies, City Council may generate new regulations and policies which will shape the City for years to come. These studies focus on a wide range of topics such as urban design, economic development, transportation and environmental issues. The goal of the Green Plan is to conserve natural resources, enhance quality of life, bolster economic vitality, and leave a sustainable legacy to future generations City of Doral residents. The plan has been organized into Ten Guiding Principles, each intended to make the City a model green community. The scope of the needs assessment includes analysis of existing facilities both public and private, data and collection, conceptual plans, financial analysis, conceptual plans, green design and space allocation and standards. The street Beautification Master Plan will service to specifically guide the development pattern along the Boulevard, as an overlay to the City’s Land Development Regulations, in order to ensure the quality of spaces and character expressed and envisions by the residents of the City. The Doral Boulevard Master Plan envisions Doral Boulevard as the ‘Main Street’ of the City, a vibrant, active and pedestrian-oriented environment where residents and visitors can live, shop and recreate. Doral Design District’s land use concept provides the base framework for the District and serves as a blueprint to guide property owners, planners, decision makers, and the general public on the desired pattern of development. It describes future land use activity designed to achieve the District’s vision as well as the City’s long-range goals for economic revitalization, creation of quality jobs, and increased employment opportunities. The land use concept is based on fundamental planning principles for the organization and distribution of land use activities in keeping with Smart Growth principles. The Parks and Recreation Master Plan will serve to evaluate current parks and recreation needs of City of Doral residents, develop a vision for the City’s Parks and recreation facilities and programs, and create and implementation strategy to guide the city toward that vision. The Transportation Master Plan was a project funded jointly by the City of Doral and Miami-Dade County Metropolitan Planning Organization, (MPO). Through public involvement, data collection and analysis, projects were recommended based on the needs of three components of the transportation system. These components include: Roadway Network (capacity), Transit (alternative modes) and Transportation Management (traffic management, policies).